It’s time once again for CIAIC’s annual gathering “Game Nation” celebrating Canada in the video game industry at GDC in San Francisco. Game Nation 2018 is the 7th annual event joining Canadian and International game professionals for the largest networking reception outside the GDC Conference. Attendees include developers from studios all across Canada, supporting partners and governments, as well as foreign companies interested in Canada. Enjoy some poutine, a beverage, and stop by the photo booth to get a Great Canadian photo! The Canada Game Nation 7th annual edition will host over 800 attendees on March 21st at 5:00pm at Jillian’s Metreon at 175th 4th Street, right by the doorsteps of the Game Developer Conference and Game Connection America. NOTE: This years event is a closed private event. Only those that receive an invite could sign up for a ticket. There are no tickets at the door. Entry is subject to first come first serve, to the venue max capacity. CIAIC is gearing up to make this 7th edition the biggest and best yet, but we need your support! Exhibit Canada’s growing video game industry, demonstrating a great place for investment opportunities. A more defined guest list to target Canadian companies and potential international partners. Increased networking opportunities to meet both Canadian and International companies. Thanks to our partners, past year’s Game Nation events have been a spectacular success growing to over 800 attendees from across Canada and around the world. Please contact Gillian Hickman, at gamenation@ciaic.ca to become a 2018 Game Nation Canadian Reception Partner. Please find sponsorship opportunities HERE. Since 2012, the Canadian Interactive Alliance took over from the Government of Canada, as the lead organizer of the Game Nation Reception. This event, in addition to other activities held at the Intercontinental Canadian Business Lounge, is an integrated part of Canada’s video game industry companies and stakeholders’ efforts to network beyond the 2014 GDC and Game Connection America to take place in San Francisco, March 17-21. To give Canadian game developers a chance to celebrate their great accomplishments. Thanks to our partners, the Game Nation Canada 2013 Reception was a spectacular success with over 700 attendees from across Canada and around the world. CIAIC is gearing up to make this 3rd edition the biggest and best yet, with your support! As a Canadian major industry player, we look forward to welcoming you and rely on your support and presence to make this year reception a success. The formal invitation requests are now closed. Contact Serge Landry, CIAIC Chairman & CEO at serge@ciaic.ca to become a 2015 Game Nation Canadian Reception Partner. Thanks to our Partners for making 2014 Game Nation Canadian Reception possible! Are you a Canadian video game developer attending this year’s Game Developers Conference (GDC)? Telefilm Canada and the Department of Foreign Affairs and International Trade (DFAIT) are looking to select a contingent of 20 export-ready independent Canadian game devs at the annual San Francisco-based conference (March 25 – 29, 2013) this year. GDC is the world’s largest industry-only event dedicated to the advancement of interactive entertainment. In 2012, the GDC attracted over 22,500 game industry professionals including 150 companies from Canada. This initiative, in line with Telefilm Canada’s new strategic vision Fostering Cultural Success, will support and showcase the selected companies during the conference. 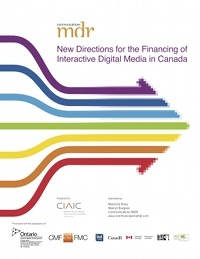 It is also aimed promoting Canadian talent in the interactive digital media industry. Additionally, the Government of Canada and its partners are supporting Canada’s leading game development industry at GDC with prestigious meeting space, matchmaking program, and a Canada networking reception, organized by the CIAIC. For more information on the GDC showcase, click here. Registration deadline with Telefilm Canada is January 25, 2013.